You ever go out trapping or fishing or anything else for that matter and just know you didn't have the right equipment for the job? Well, this story illustrates all too well what can happen when your equipment isn't maintained as it should be or simply isn't the right tool for the job. It was a beautiful clear, cold morning, the frost heavy on the tree branches, making the world a white surreal landscape. Trapper Mac set out on his trap lines with my brother Matthew and I. We pulled up to a fox set he had placed in a small wooded knoll on the south side of a small gravel road leading to a place we called Hidden Lake. As he left the truck to go check the set, Matthew turned up the radio and switched it from the monotonous drone of talk radio to a rock and roll station. As we sat in the warm truck jamming to tunes, Trapper Mac was in the midst of a whole new dilemma. He had put out a trap with a long line. Meaning, whatever was on that line had about four feet of free movement before the trap stopped it. This morning, a big Grey Fox sat in ambush, with the trap around a rear paw, waiting to show us just why that long line was a mistake. Trapper Mac weaved his way through the dense saplings into the small clearing, out from the underbrush exploded the Grey Fox headed for his throat. It moved with intensity, the cold air smoking from it's gaping mouth. It dove straight for his throat, Trapper Mac back pedaled and went to his hip and found only his mink "kill stick", about 18 inches of hardwood. Great for a Mink, not so much for a big 'ole fox on a 4 foot chain. The fox landed with two feet on his chest and the rears on his legs, shredding his hip waders while clawing it's way toward his throat. Trapper Mac eluded the Fox's jaws as he tumbled backward from the force of the initial lunge and out of it's reach into the saplings near the clearing. "Mike! 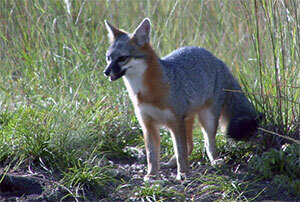 ", he hollared as he scrambled back to his feet, the fox glaring at him, it's white teeth bared. "Get the gun and get up here!" He looked around for alternatives as he waited for the gun. He grabbed a nearby sapling and broke it off. It's fresh green flesh forcing him to twist it and tear it away from it's roots. "Get the gun...get the gun", I heard Trapper Mac screaming from the hill obvious distress in his tone. I jumped out of the truck, grabbed the .22 cal. single shot pistol my Grandma Minnow had given him for trapping, and ran up the hill. As I neared the clearing the steam from both their breaths created a fog to the area, giving it a mystical look. They circled each other like two pit bulls in a fight to the death. The arena was the four foot circle the fox was forced to stay in. Trapper Mac desperately wanting to be in that circle to kill that fox. It's paw now about half way out of the leg hold trap. It was lunging constantly for Trapper Mac every time he moved in on the fox. Trapper Mac held a two inch thick sapling he had broken off, strips of green, twisted wood dangling from it's end. The sapling was too long to wield effectively and too soft to be a good "kill" stick. I moved in close to the fox, as it stood growling at Trapper Mac, I aimed right at it's ear hole and fired. Miss.... not just a miss but a miss by two feet. "Shoot the Fox, not me!" Trapper Mac said. The fox turned and looked at me, steam rolling from it's mouth, it dove for me, I fell backward into the bushes. Luckily I had fallen just out of it's range. "I'll get the rifle, otherwise this is going to take all day". Matthew said, running down to the truck to get the rifle. I opened the chamber to reload. I pulled out my skinning knife, pried the spent cartridge from the chamber, dropped in another round, closed the chamber and took aim. I aimed about two feet to the right of the fox, BANG... hit, right between the eyes. Smoke curled from both it's ears as it stared at me. I think I only made it madder. I fired three more rounds, the pistol was so inaccurate at two feet away it was simply a guess as to whether or not I hit it. It lunged, for me again, it caught me off guard while on my knees trying to reload that damn pistol again. It moved in slow motion as I watched the jaws come in for my throat, helpless to do anything in the position I was in. Trapper Mac caught it across the shoulders with the sapling bringing it to the ground at my knees. "Quick he said, get on it's chest". I stood on the fox until all life had left the beast. Now, over the next half hour we laughed like mad as Trapper Mac relived the moments of that pistol and reloading the thing as the fox kept trying to get at his throat. Next time we went out we had a shiny new .22 cal. revolver in the truck along with a shotgun and a .22 cal rifle. Oh yeah, the radio was off limits as well. Go figure.